A favorite Festival tradition, Family Day is the perfect way to celebrate the start of season of kindness and cheer. Choose between Breakfast with Santa or Sundaes with Santa while also touring through the hundreds of decorated trees or making crafts at Santa's Workshop. Costumed characters like Frosty the Snowman and Mrs. Claus, Nutcracker ballerinas, and more will all be there and every event ticket also includes a photo with Santa! 8:00, 9:30 or 11:00 a.m. Enjoy a continental breakfast with Santa, Mrs. Claus and other Holiday friends! Adults must accompany children. Reservations and tickets required for both adults and children. 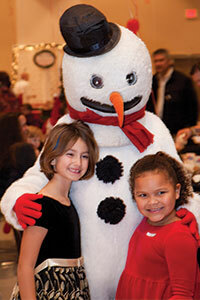 Make your own ice cream sundae and meet Santa, Mrs. Claus and other Holiday friends! Adults must accompany children. Reservations and tickets required for both adults and children. 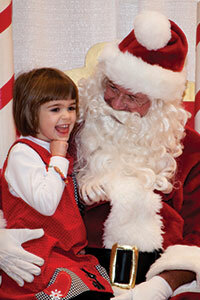 Enjoy children's Christmas crafts and goodies, costumed characters, storytelling and photos with Santa! $8 per person - includes admission to continental breakfast or sundaes, festival tour and photo with Santa.